Sorry to let you know Shear water Tavern has decide to hold off on the live music. There will be no more music but Aloha Friday's are still awesome. Happy Hour 5-6pm Nightly food specials and quick service. I might even join you! Mahalo Reed, Nui and staff look forward to working with you all again. AWESOME First show at Down The Hatch in Lahaina. If you don't know, you NEED to know. This is the place to eat fish. Located at the Wharf Cinema Center. Now this is a place growing up in Lahaina was a cool hang out across the street from the Banyan Tree. Payed Parking in the rear, lot's of little shops and restaurants and this is one need to go spot. Order up at the kitchen counter, grab your number and they bring you your food in spectacular time. Bruddah Dave is the Bartender that I happen to work with Sunday night's at Duke's Beach House. Super cool bar that's been there forever three television sets in the background with sports playing, really cool spot to stop and grab a drink and go or stay and pick up a game. Today the opening day for NFL the excitement was in the air for sure. Back of my eye Johnny from Kahana Fish & Game was working the grill this morning. Caleb running the front of house who I have had the pleasure of working with at the Westin K.O.R with, I already felt at home. First thing i notice is the Food looks incredible. Breakfast was still being served and the Eggs Benedict looks like the first thing I would go for. Second would be this waffle slider looking dish with a stick of rosemary on the top. Just from first glimpse the food coming out of the kitchen looks like that from a world class restaurant, very smooth presentation. Lot's of people popping in and out listening to music, walking the mall, working the shops, eating, drinking and enjoying a beautiful Maui day. Looks like you can still get a table to sit and take it all in. When you come to Maui DO NOT pass this one up & please come down when I'm there keep me company. Needless to say impressive spot on the west side. If you living on O'ahu and love you some #organicislandmusic or even if you don't really know what that is. Join me for one night only in Kaka'ako at the new MOKU Kitchen. Check Show times and listings for changes & details and of course follow on social media. 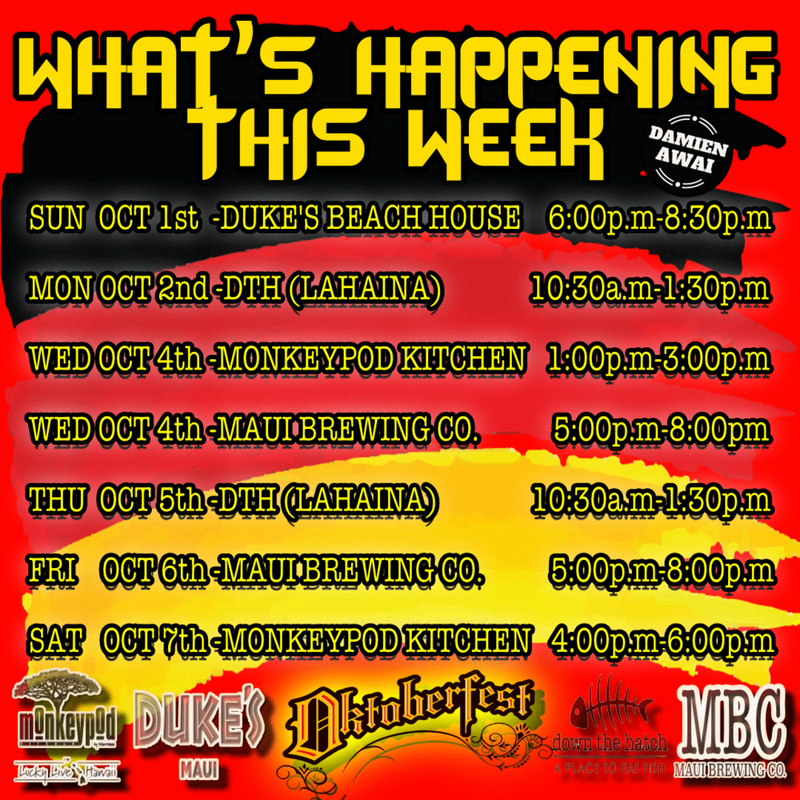 Halloween At the Maui Brew Co. The alternate to your average Halloween! No costume required but always welcome just a kick back session of #organicislandmusic stop by and pick up a brew or two before you head out to enjoy you All Hallows Eve. Pick up a shift with me over at the Kahului Ale House. Live music from 5-8p. Aloha Served on tap so come feel the vibe on a Saturday night. Joining me on stage will be Captain NeeMo on guitar.